A popular concept from Greek mythology is that of the three Fates. The Fates are goddesses who hold the power to determine human destiny. If we apply the myth to the environmental impact of the building industry, the three Fates would be operational, refrigerant and embodied emissions. Indeed, the destiny of how our industry fares in the face of climate change depends on these three factors. lifetime. Despite the importance of all three emissions, most building practitioners and policy makers are focused solely on operational emissions (those tied to energy use), often leading to poor design and policy choices. There are locations where refrigerant and embodied emissions can be the largest source – like the example from a Seattle building to the right. In order to create built environments that are true climate solutions, buildings must holistically resolve their emissions. This means measuring the operational, refrigerant, and embodied emissions of all buildings. Collectively, these three sources of greenhouse gases reveal the true global-warming impact of architecture. We must create building metrics and policies that consistently measure all three sources. Additionally, we must incentivize building creators and operators to implement solutions to dramatically reduce the impacts of all three. Operational emissions have been the main focus of the current generation. Globally, progress has been made to improve energy efficiency through building codes and regulations. Countries also have started to require buildings to measure operational emissions based on their fuel sources. Concepts like net-zero energy have helped to shift the conversation from being just about efficiency to also include balancing demands and production. However, very few buildings are actually achieving net-zero energy globally1. Recently, some are scaling up, but they are still well behind where they should be to meet climate targets. The chart shows how the top 25 Project Drawdown solutions could be paid for by the 300 richest people in the world even after keeping a billion dollars each. Refrigerant emissions have been mostly overlooked by the building industry. Performance metrics do not directly measure refrigerant emissions, yet these invisible gases typically have had extremely high global-warming potentials (often 2,000 times that of carbon dioxide) when leaked to the atmosphere. 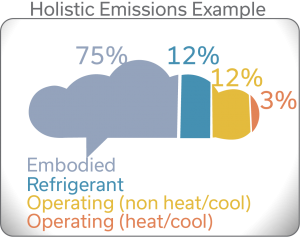 This means enormous quantities of refrigerants with high global-warming potentials are being installed in buildings across the world—in equipment that will require refrigerants for their operating life. Equipment can last over 30 years, so the refrigerant phase-outs will be delayed far past global agreements. Since there are mechanical-system solutions that pump water around buildings rather than harmful refrigerants, policy makers should consider limiting mini-split and VRF in their jurisdictions until the technology evolves to use refrigerants that are safe for the planet. Embodied emissions are the least understood form of emissions around the world. They are tracked using a Life Cycle Assessment (LCA), which measures the impacts of building materials on global warming. LCA analysis includes extraction, manufacturing, construction, maintenance, and end-of-life emissions. Two international standards, ISO 14040:2006 and ISO 14044:2006, establish methodologies for completing LCA. There is progress towards accounting for embodied emissions in some newer codes like ASHRAE 189.1 and third-party rating systems such as LEED, but it remains far from mainstream. One of the key advantages of LCA analysis is that it can help keep out building materials with high global-warming impacts. A good example in the US is XPS insulation. The manufacturing of XPS uses blowing agents with emissions so high that the emissions saved by insulating a building cannot offset those produced in manufacturing the insulation. 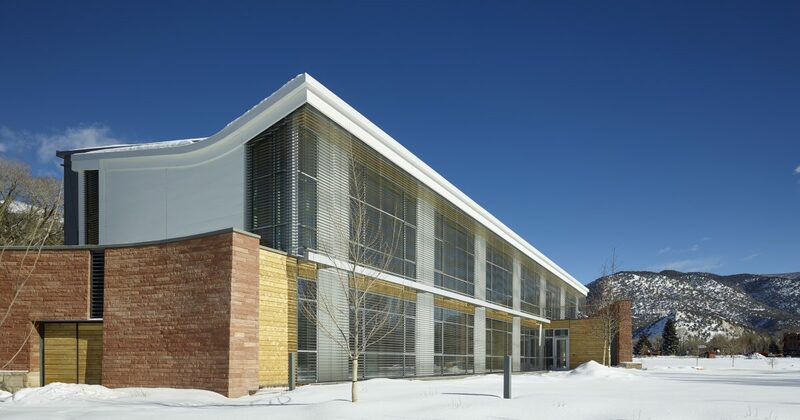 The Rocky Mountain Institute Innovation Center is an example of a project that addressed all three emissions. Despite being located in one of the coldest climates in the US, the building has been operating with net-positive operational energy. It was designed with almost no refrigerants, and it is on track to offset its embodied emissions through the extra energy produced with PV annually. The building will be able to achieve net-zero carbon as it offsets the operational, refrigerant, and embodied emissions with excess solar output to the grid. Once it has paid off the debt of the embodied emissions, it will be truly net-positive. The world needs more net-zero carbon buildings. We need global leaders to accept the challenge of implementing positive solutions in every country. 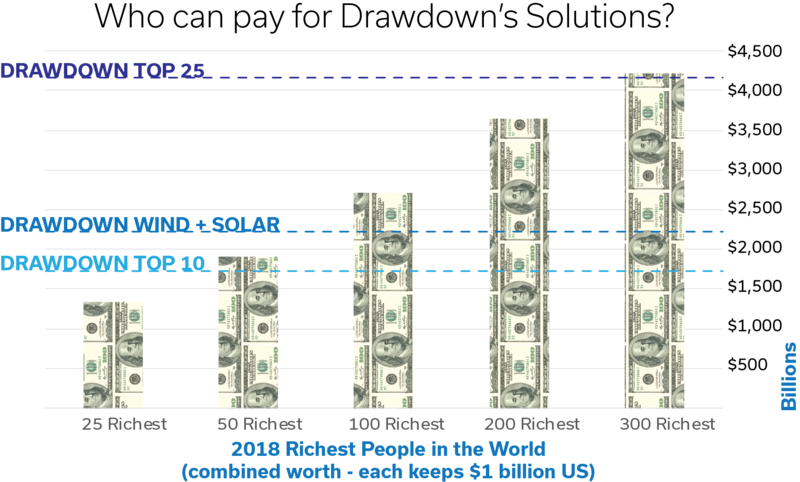 The 300 richest people in the world have enough money (even after keeping one billion each) to implement the top 25 Drawdown solutions. These include onshore wind turbines, solar farms, and rooftop solar for the entire planet. We need more people stepping up to lead us toward drawing down the carbon dioxide in the atmosphere. Measuring all three emissions is a key step that the building industry can take toward achieving this critical outcome. Advocate and act now. All of our fates depend on it. David Mead has over 15 years of experience as a high-performance building specialist, engineer and architect. He has extensive experience in sustainable design, including greenhouse gas inventory tracking, passive building strategies, renewable energy system designs and the creation of sustainability guidelines for large organizations. This involves research, innovation, engineering and verification of concepts. A committed advocate for net-positive buildings, Mr Mead brings an innovative approach to GHG and energy analysis to advance building performance towards a carbon neutral future.